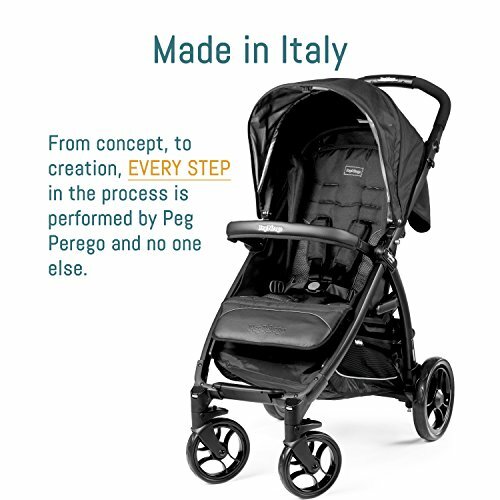 The Peg Perego Booklet stroller is one of the perfect candidates for parents who would like to have the flexibility of transforming their stroller to a baby travel system. Not only can you quickly click on your Peg Perego Car Seat but you also can recline the seat to almost flat so that your newborn can comfortably lie on it. It can be used from birth until your baby is older (around 0-36 months). The Booklet has a four-wheel smooth drive system. The front wheels can either be swiveling or locked. The rear wheels are fixed. 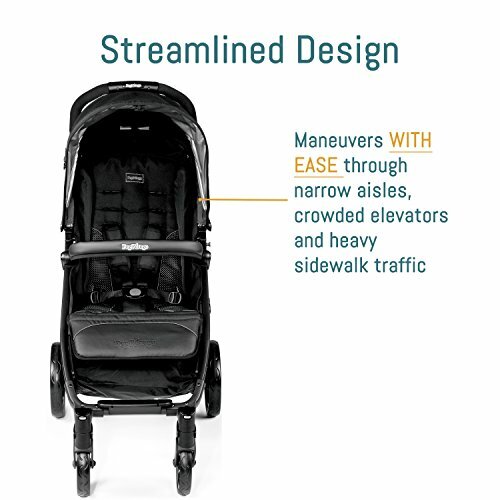 30-percent less effort is required to maneuver it compared to ordinary strollers. 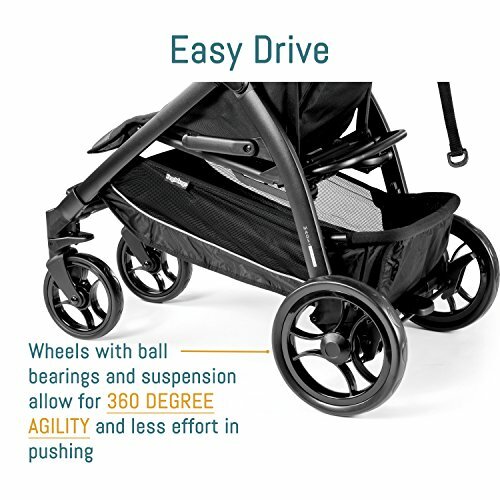 While the wheels can handle all terrains, do not use the stroller for jogging as it definitely is not made for that purpose. It also has a centralized rear brake which is good. Just one step and you’re safely parked. How extendable is the canopy? The Booklet’s canopy only extends half-way. One thing to note about the Peekaboo window is that it is small. It is located on top of the canopy and it has a cover should you need to “seal” it. 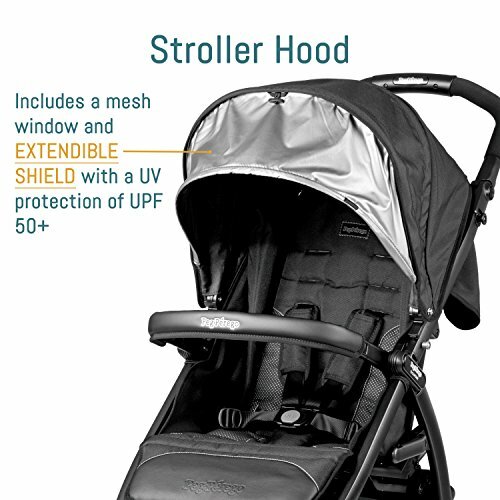 It is worth noting that the sun shield UV Protection of the canopy is up to UPF 50+. There is also a loop to hang baby toys which is a plus to keep your little one entertained. The handle is height-adjustable. Whether a tall Daddy will be pushing it or a little Mama, you don’t have to worry. Just adjust the handlebar and there will be no hunching necessary to push this stroller. The Booklet can be folded with one hand to look like a book-fold. While some travel system strollers can do this as well, the Booklet is probably one of the easiest to fold. While many would require you to use two hands, the Booklet only needs one hand – guaranteed. What good is a one-hand fold if it cannot stand by itself? This stroller can freely stand alone so you can attend to other things without worrying about the stroller falling to the ground. Being a parent requires your hands to be ideally free so it can do other tasks. If it can stand alone, you can also save space if you want to store them. And being able to keep it upright, you can limit the contact of the fabrics to the ground keeping them as clean as possible. The child’s tray is an optional accessory. It would be good if it is included though given the price tag. And although your child can live without it, it would be an excellent accessory to put your child’s toys, snacks or drinks. The cup holder is also part of the optional accessories. Should you opt to get a cup holder, be sure not to put anything hot on it to avoid accidental spills to your child. A parent tray would be ideal, but it doesn’t come with it. A universal stroller organizer in the handlebar would be a lifesaver. Usually, you can keep things there that you would typically need immediately such as your wallet and phone so that you don’t have to keep on digging for immediately needed things under the basket. The upholstery is made with polyester and easy to wipe clean. You can also remove it and wash them. Once you recline the seat, you can open the flap to reveal the mesh netting behind which is large enough to see your little one as well as get some ventilation from behind especially in hot weather. There is a large storage basket with an “easy load” system that can accommodate a lot of things, even a large diaper bag! This is a big plus since it is usually not advisable to hang your heavy diaper bag on the stroller handle. Putting your stuff underneath would keep the stroller from not tipping over. Some parents complain that the basket rubs against the floor, and it is because they might not have installed the basket correctly. IT SHOULD NOT rub against the ground once you install it correctly. The basket is also very accessible on all the sides. To access it from the front, you have to move the adjustable leg rest out of the way. It has a 5-point safety harness – the most secure option! The harness can also be adjusted to different heights. 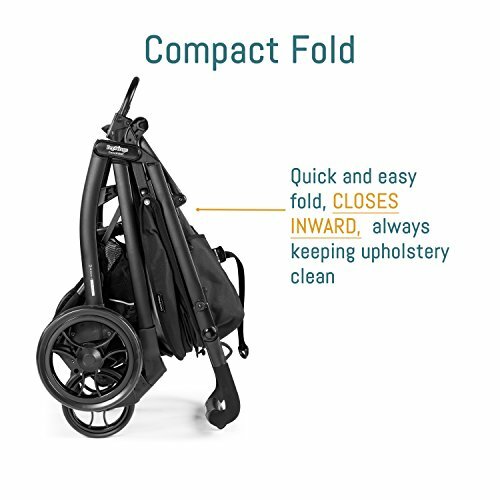 If you are looking for a one-hand fold stroller that can be a travel system as well, has a large underneath basket for your stuff including your diaper bag, and would love a compact fold to throw the stroller in your car trunk, Peg Perego stroller can do the job for you. 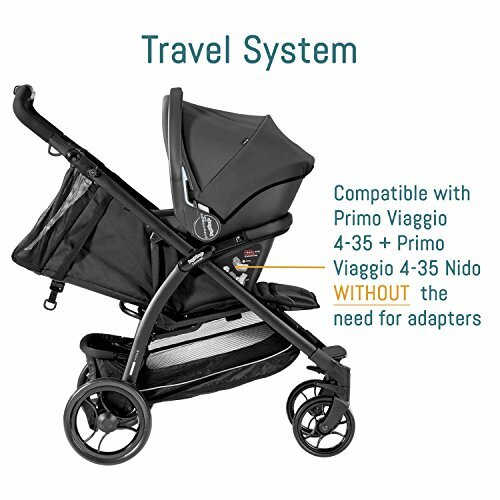 The Booklet, however, is limited to Peg Perego car seats such as the Viaggio SL, SIP 30-30 and Primo Viaggio 4-35. 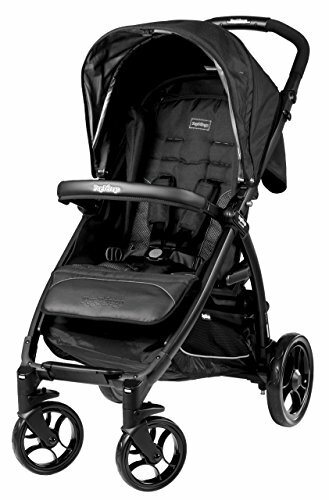 The Peg Perego Booklet Stroller can also be an option for parents who, for any reason, don’t own a car seat. 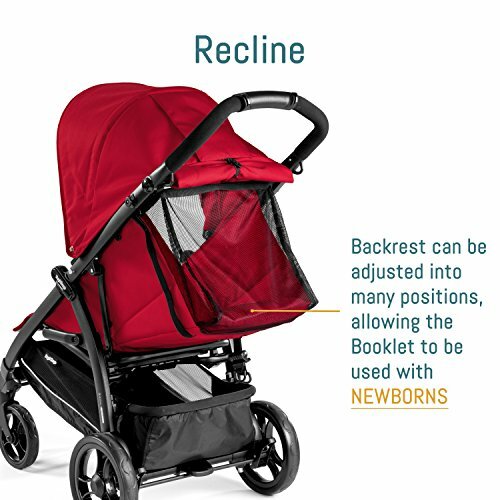 The backrest can recline to almost flat and is safe to accommodate your newborn. It can also grow with your child until three years old. This stroller is not very heavy, but it is also not very light. You have the option to drag it behind you like luggage and you don’t really need to lift it except when you need to put it in your car trunk. It compactly folds which is a space saver and although bulky, it is not as bulky compared to other travel system strollers that don’t fold like a book. I highly suggest that you check out the feedbacks of parents who already got this stroller to help you decide further. If you have any questions, don’t hesitate to leave them below the comments section, and I would get back to you as soon as I can. Hi at what age/weight should your child use the stroller without the car seat? My LO is 5 months 17 lbs now using with car seat facing towards me. The Peg Perego Booklet can recline to “almost” flat – around 140 to 150 degrees. Using its flattest incline, it is perfectly safe for young babies. The Peg Perego Booklet cannot be converted to a double stroller. Are you still looking at Peg Perego brand for a double stroller? The basket absolutely rubs on the ground with anything in it, even if you’ve installed it correctly. I would not have bought it, had I known this. It is supremely annoying. Also, the car seat faces out- something that I didn’t know would bother me as a first time Mom, but totally does. This video from Peg Perego shows how to install the basket correctly. Although it is specifically showing instructions for the Book and the Book Plus basket, they all do have “similar” basket structure, so I hope it can somehow help. Also, about the car seat facing out – this video will demonstrate how you can put the Peg Perego car seat in the Booklet stroller so that it faces you. I believe that the Peg Perego Pliko P3 is quite compact so storing it will not be a problem. Having a folded dimension of 54 X 102.5 X 86 cm (width, height, depth), I am sure you’ll find a corner for it since it can stand on its own. 🙂 I don’t see the need to hang it since it won’t need much storage space anyway. 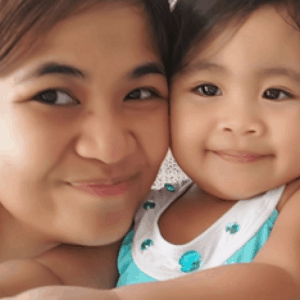 My daughter is 30 months old, weight around 14kg and height around 95cm. I bought her a bookplus when she was 18 months old and she cannot fit in anymore because her head touches the canopy. I’m wondering if the booklet can fit her since the sitting position seems lower than the book plus. I’ve looked around other options and seems that baby jogger city mini GT is something that i can consider. I still love the peg perego because i can hang quite a lot of groceries and it won’t backflip whereas baby jogger doesn’t allow anything to be hang on the bar. Any thought? A mom did a youtube review on this stroller. She said she’s using the Peg Perego Booklet for her 70-pound (around 31.75 kg) child. She also said in the comments section that her daughter is 48 inches (121.92 cm) tall. According to her, the seat measures 25 inches (63.5 cm) from the seat to the canopy. You will have to recline the seat so that your toddler’s head doesn’t touch the canopy. I bought the book pop up seat only at an auction for $25. It is brand new. However…I am having a very difficult time finding the stroller frame or chassis. I have checked many places and have had no luck. I can’t even find it on their website. Do you know of anything else that is compatible and will fit the seat perfectly?? You can use the seat you bought to a Book Plus Chassis or a Book 51 Chassis. I checked and they are available from Amazon UK and Amazon Italy. You Can Also Check Ebay. There are two sellers that sell the Book Plus Chasis. Which stroller do you recommend between the Book and Booklet? The Booklet seems to get higher reviews on Amazon, but I haven’t seen them to be too different, according to your review. 1. If you need the rain cover as an included accessory, then get the Book since the Booklet does not come with it. 2. Which fabric color do you like better? The Book and Booklet come in totally different colors. 3. When you move the canopy of the Book all the way down, the mesh canopy can serve as an additional Peekaboo window. 4. The Booklet’s mesh is situated more at the lower back than at the top part. Colors are just secondary to me. I can ignore it in fact. Price-wise, you save USD 14 for getting the Book since the rain cover is priced at USD 34 should you decide to get it with the Booklet. I have a more detailed side by side comparison here. Do you know why the Book Plus was discontinued? I just bought the last one at Toys R Us (brand new in box but manufacturing sticker says 2015…) I much preferred it because of the removable seat (light weight with new born when using frame only and car seat) and the option for rear and front facing the seat when it’s on (specifically didn’t want to pay for the unwanted bassinet in Book Pop Up) And do you know if they’re coming out with a newer replacement model? I’ve looked around the web looking for answers, but there isn’t any official statement as to why the Peg Perego Book Plus Pois Grey, Stone, Flamenco and Mentha were discontinued. There isn’t any news about a recall, too. The only one color that doesn’t have any “discontinued by manufacturer” warning it in is the Pois Black. However, it’s quite hard to find where to buy it online as I checked. I honestly like it the most compared to the Booklet, Book and Book Pop-up because of being able to use the chassis during the early months that you still use infant car seats. I spent last year researching strollers for my grandson. i settled on one that has some of these features but without the hefty price tag. I think the biggest problem for me with this stroller is that it is only front facing. Not really the best option for a new born if you ask me. But that’s just my opinion. This looks like an awesome stroller. I really like the storage basket and it looks like it’s pretty accessible. The problem I have with my current stroller is that it’s not as easy to push and when my kids are sitting in it then it’s really hard to get anything in or out of the storage basket. This looks like it’s very compact, durable, and safe for kids. Other than the storage basket dragging, are there any other complaints people have had about this? Some people find that it is massive to carry. Though I can only see the need to carry it is when you need to put it inside the car’s trunk which is not even 20 seconds. Also, some find it not funny that the cup holder drops whenever you fold it. I guess here that the cup holder installation has some issues. Maybe, they can refer to the manual once more. The major complaint I heard so far is that it is only forward-facing. Most first time parents especially mom would want their newborns to face them because they have the tendency to be paranoid that something will happen when they are not looking at their infants.